This large,1600 square foot Condo has an Open floorplan. It's a Sunny and Fresh, four bedroom, two bath condominium unit on the second floor with a great view from the deck to check out the surf in the morning. Watch the fireworks every Friday evening from our entire second floor deck. It is only seven houses from the Beach and Boardwalk in the center of 3 major Water and Amusement Parks. A short walk to Restaurants and Shopping. lmkuep at verizon net for the availability and rates. YOU WILL NEED TO BRING SHEETS & TOWELS. NO SMOKING & NO PETS ALLOWED. New Tile floors throughout living areas for easy clean up and carpet in bedrooms. A fully stocked Huge Kitchen, All New Stainless Steel Appliances, granite counters and cabinets. ,Dining (feeds 12) and Living Area with high cathedral ceilings. Enjoy a 55 inch TV in living room and a 37 inch in Master Bedroom. Beautifully furnished and custom decorated. A very Comfortable and Relaxing seaside retreat. You won't mind having to stay in when it rains. 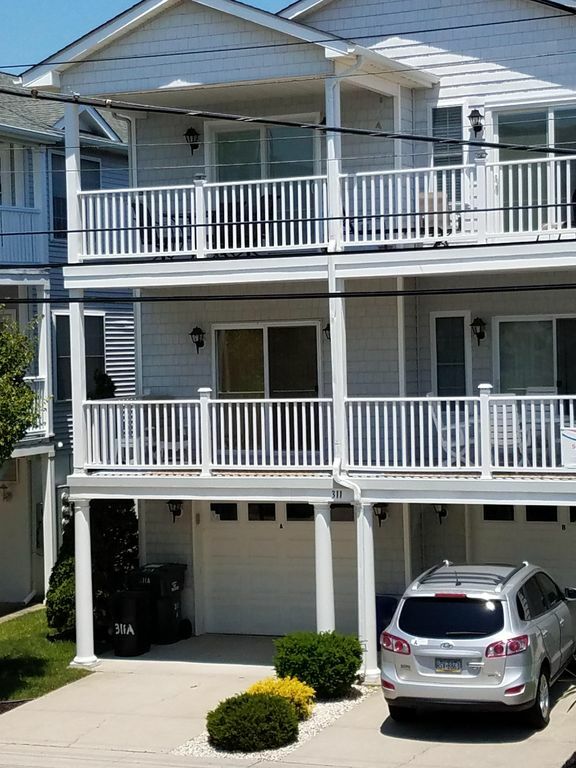 Keywords: Ocean/Boardwalk View, 2 Family Home - 2nd floor 4 BR, 2 Bath, Private outside shower, All major attractions within walking distance, See our guest comments!! This is the perfect location to park your car and be within walking distance to all of Wildwood's attractions. Entire second floor with view of the boardwalk and ocean to relax on and enjoy the Friday Night Fireworks.